HackerRank 30 Days of Code Solutions. 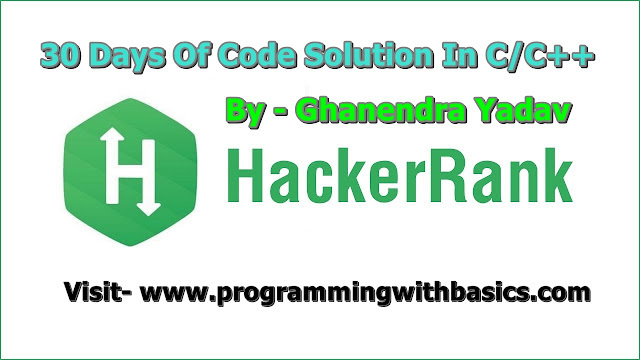 We have listed 30 days of code HackerRank problems solution. 30 days of code is a practice by HackerRank for 30 days, you can practice a problem day by day. You can find a solution for others domain and sub-domain solution ie hacker rank solution for c++ subdomain introduction, strings, classes, STL, inheritance, other concepts, algorithms, miscellaneous. You can also find the solution to other programming problems ie, data structure and learn to programme by practice and regular practice. We are not yet done because we have other programming site solutions also ie. Geeksforgeeks solution for a various domain like school, basic, easy, medium, hard. I am 100% sure that you can enjoy and practice huge problems in various categories and different- different language such as C, C++(CPP). and Java. ★★Update-Fab-2018★★:- We also provide an android project ( app design ) in minimum price ( all over India ). If you want an android app, just send me your requirement. I will definitely provide the app at a minimum price. For more details. Extreme Recommended:- Like our Facebook Page or Join our Facebook Group and Google plus Community. Plese share our post on social media platforms and also suggest to your friends to join our groups and like our page, don't forget to subscribe. Enter your email and click to subscribe. Below is the list of 30 days of code program, I recommended check all solution but before going for a solution first try to solve the problem own. There are some other programs after the 30 days of code you may also see. 1. Day 0: Hello, World.